When Julian first met Angie, her social circle was limited to her immediate family. Angie’s outings primarily consisted of visits to the pharmacy and shopping for groceries – both of which were steps from the home she shared with her mother. Angie described herself as being anxious when she was more than two blocks from home. As a Community Connector with Kinsight, Julian is familiar with the impacts of social isolation. When he began working with Angie, his initial goal was to get to know Angie and her family and to explore her interests. 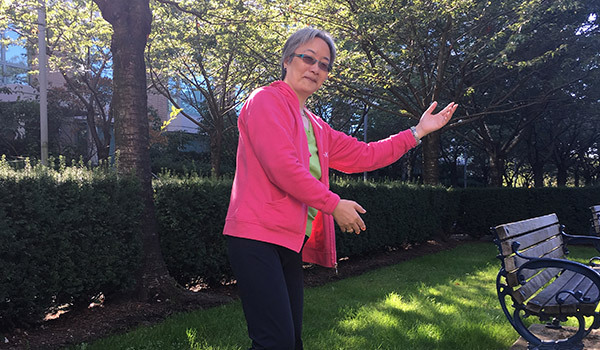 “Angie was intrigued by people practicing Tai Chi in the park,” Julian recalls. Out of that observation, they explored the idea learning Tai Chi. They worked on a several confidence building strategies and skills, from identifying a studio where she could enrol in Tai Chi, to learning how to take transit there. Angie began taking classes about three months after they started working together, and she loves it. She especially likes meeting and talking to people, she says. “I can do things on my own; I can get to know the bus routes on my own,” Angie explains. In the 10 months that Julian and Angie have worked together, she has had some highs and lows, including the loss of her mother. She is grateful for her community connector experience, and is proud of her accomplishments. Julian hopes Angie continues to pursue her goals of making sustainable connections with people by using the skills they have built over the past year. They’ve discussed options for Angie to get involved in other group activities, such a walking club, which would help build her confidence when she is out in the community. By all accounts, Angie is well on her way. Most recently, Julian met with her at “New West Coffee and Friends,” a social gathering meet up. “Angie was motivated to attend the meet up and it was great to see her chat with some new folks,” Julian says.